Cut banana, kiwi , ginger and insert them into your blender. Mix first. Add the basil and remix. Add the spinach shoots and 20 cl of almond milk. Mix for a few minutes and enjoy! 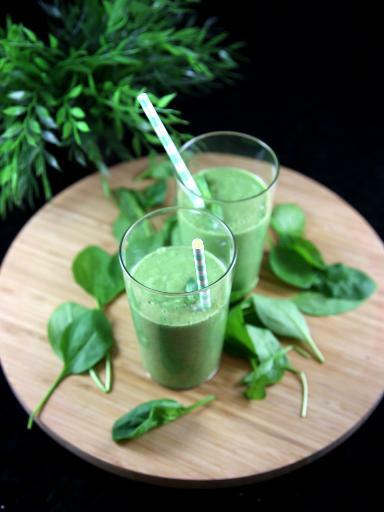 Very much in vogue in the United States for their nutritional quality, this smoothie is perfect for breakfast or tasting. It can also be consumed throughout the day. Prepare it in the morning, and take it with you to work! This mixture of raw vegetables allows you to ingest a large amount of greenery during the day, and the fruit helps to soften the bitterness. Green leafy vegetables provide us with chlorophyll, vitamins, minerals, fiber in abundance, complete proteins (yes!) And a host of phytonutrients that reduce the risk of disease and increase our vitality and overall health. Do not hesitate to alternate the ingredients and try new ones!